The verdict: If you are from New York, you perhaps understand that there are certain culinary items that we have uniquely mastered as a region; bagels is one of the items that come to mind. Whether it is the water or some other form of magic, I’ve never had a bagel that tastes quite like a New York bagel. Naturally, if you master the bagel, you’ll need to master the toppings that are delicately placed a top. Cream cheese doesn’t seem to have the same regional variation that bagels do. But once you get into lox and bagels, then yes, there is some local lingo you’ll want to be aware of. 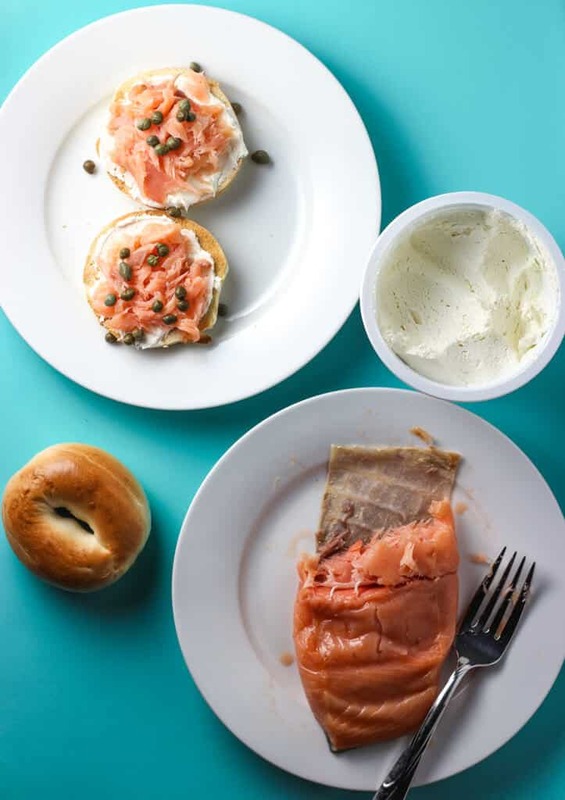 A bagel with cream cheese and lox might not mean salmon like the one I am about to get to. Lox or gravlox, is cured and not smoked. That leaves it with the texture almost similar to what you might find in sushi. Yes, there is a taste difference between it and sushi, as there are different knife skills required by those preparing it for you. When I’ve had lox in other places, I tend to find their interpretation of “lox” means something smoked. With a texture much like the product here. Now, this is a drastically different texture than gravlox. This has the texture of an almost cooked salmon filet. Except it might be considered “undercooked” if you had baked this yourself. Being that this is hot smoked, this would have been prepared in a low heat environment that might take hours. Thus leaving you with a texture that is closest to a baked salmon that was removed a bit too soon. Have to fear though, for the amount of time it was cooked, it is a fully cooked item. This is packaged well and vacuumed sealed as tight as anything I’ve purchased. As I was taught as a kid, “Fish and company both stink after three days.” I’ve found that I agree with the seafood aspect of that statement. This is best consumed right away. As for a usage beyond just bagels, yes, you could use this with pasta or any dish you can creatively incorporate salmon. However, this is a bit of a premium product. 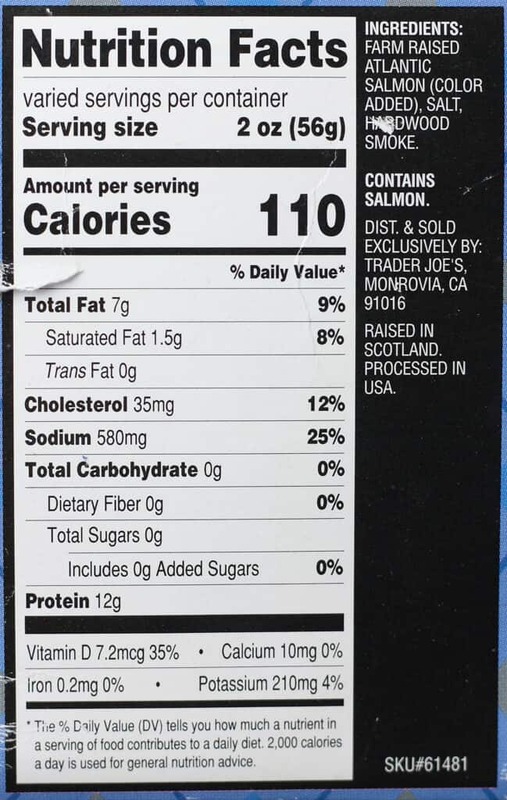 For $7.59 for my package or $15.49 per pound this is priced well above Trader Joe’s Wild Alaskan Sockeye Salmon and Trader Joe’s Farm Raised Salmon. You aren’t just paying for the salmon here, this is a process that takes hours and that is what you as a consumer pay for. The gravlox that I adore so much, comes from a local bagel store and they price it per 1/4 pound. So I’m pretty sure that per pound, gravlox at my favorite spot is pretty much double in price. Would I buy this again? If I was anywhere but New York and was without good bagel stores, then yes, I would buy Trader Joe’s Hot Smoked Scottish Salmon again. Otherwise, I’m sticking with either their fresh salmon or going to my local bagel store for my salmon fix. This is a great post. I’m glad you mentioned the difference between lox and smoked salmon. Some lox/gravlax are cold smoked as well as cured but as you said, not the same as this hot smoked salmon. If you flake it up you can make a nice salmon cream cheese spread. The price has something to do with the Scottish salmon. Organic farm-raised Scottish salmon is some of the best farmed fish you can find. My wife ordered a piece at a special dinner and is far better than any other Atlantic salmon I’ve ever tried. Hey BuyingSeafood! Thanks so much for stopping by. You always have such great insight on this topic. It’s great to know that organic farm raised Scottish salmon is so much better. I’ll have to keep an eye out for that. Thanks again! 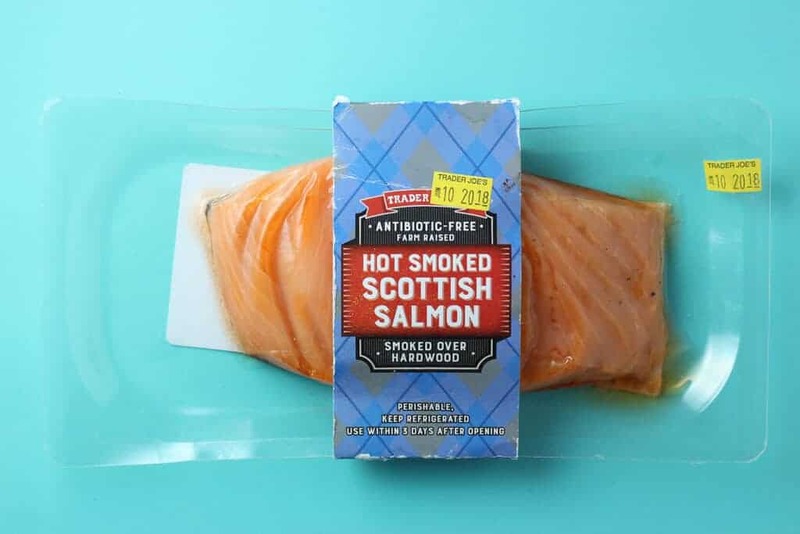 I recently tried TJ’s Scottish hot smoked salmon and I too was completely underwhelmed. The flavor tasted artificial, and the texture left a lot to be desired. When I went back to TJ’s I noticed that there is another hot smoked salmon next to it is a green package, so I gave it a try. Forget about Scotland, This other hot smoked salmon tasted more like it was dropped from heaven. Rich smoke flavor, and a perfectly meaty, flakey texture. The price tag was only slightly higher, and let’s be real, there are some things in life (tattoos, brain surgery, salmon) that you just don’t want to go bargain shopping for. So I suggest walking past the Scottish hot “smoked” salmon and reach for the other TJ’s hot smoked. Hey MK! That’s great to know. I haven’t gotten to far into the smoked salmon varieties yet and I’m glad to hear that there are some really good choices there. Thanks so much for sharing your valuable insight!